At 2:00 in the afternoon, having had a filling lunch we were off again. Now the Eastern gate is a little more far away when compared to the Central section. So it took us about 20 minutes to get there. Pushkar had to get his permit, which again we got without further ado and we were ready for the jeep safari. 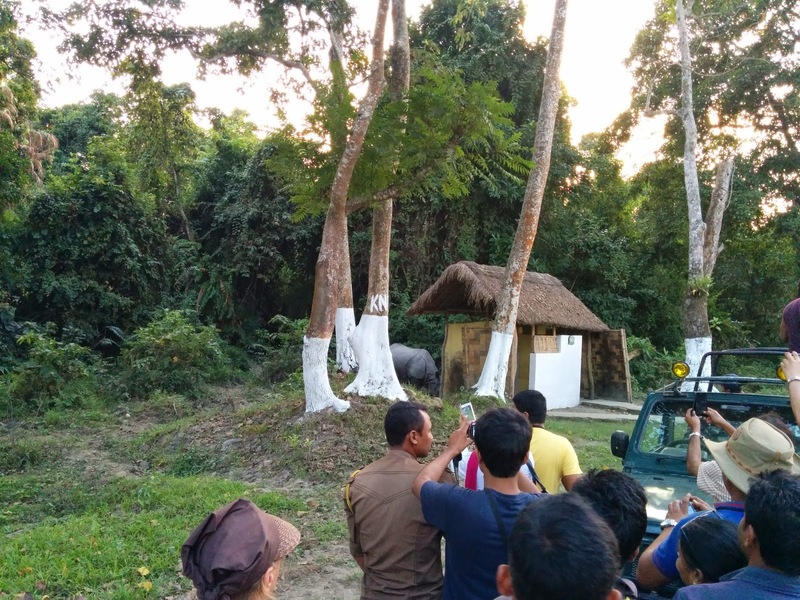 A slight digression to provide some information regarding the park, which I had not bothered to check-up on before I got to Kaziranga, but may be of use to any of you planning to head there. This, however means that not the entire jeep trail is open in November. That is because, a lot of the roads and bridges along the trail would be in need of repair after being underwater for most part of the rainy season and a major section of the trail is closed off for these repairs. So we had only a limited trail available to us, that day. Despite this, November is a great time to visit the park, because the poor animals have been used to months of privacy and tend to venture out on the trails, unaware that us tourists will be out there gawking at them. So more the chance to see animals from close-up. What happens to the animals when the park is submerged in water? I hear you ask. The Elephants, I believe, tend to travel long distances, so they get away. The Rhinos move in a relatively smaller radius. In order to provide shelter and dry land to the animals, the National park with the help of the Indian army has created "islands" using large tracts of land, these are higher than the rest of the grassland and come the rains, the Rhinos and other animals get onto these areas. So all good. Okay, back to the Jeep safari, so I wasn't expecting anything spectacular, but as mentioned, I was hoping Pushkar would point out certain bird and animal behaviour that would enlighten me. "This" was a Rhino charging right at us! Now,there were 3 of us in the jeep. The driver at the steering wheel(fairly obvious), Pushkar was in the section behind the driver's seat and I was in the third section of seats on the jeep. We had stopped by a lake to look at a flock of migratory birds, when we heard a call, and a thundering sound. When we looked back, we saw this rhino charging right at us. It was like being on a railway track and an engine coming right at you! Just when we were wondering what we do next, the rhino veered off to its right, only to be followed by another rhino! Which is when we realised, that the first one was being chased by this rival and had decided to make a run for it, rather than stay and fight. Though Pushkar has done a fantastic job of capturing the moment in the picture above, it still does not do justice to situation. There is NOTHING like experiencing first hand a rhino running at you. Now, the second rhino saw us, and decided that we were slightly more interesting than chasing the other rhino. I think he was just tired of all the running and wanted a break. He spent that break time, standing and staring us down. As if challenging us to try and pick a fight. So for the next 17 hours we kept staring at each other. Okay, that is not true. It was not 17hours, this staring bout lasted a few minutes, but felt like hours and we weren't complaining. This was a rare thing to happen and we were transfixed. Eventually, the rhino decided that we were, after all, not that interesting as to occupy the rest of his evening. So, he marked his territory (on the trail, not on the jeep) and rhino, exit stage left. Though there were many safari jeeps ahead of us, they had all missed this, as they had not stopped to look at birds in a pond. We were the only spectators around. Each of these safari's last for about an hour and half to two hours. It depends on how much you want to stop and observe. But the gates close at 5pm and you have to get out, before that. On this safari, we saw a lot of rhinos up close. Maybe, it was the eastern section. Maybe, it was the time of the day. I did not bother clicking any pictures of these rhinos. We were still overcome by what we had just witnessed. 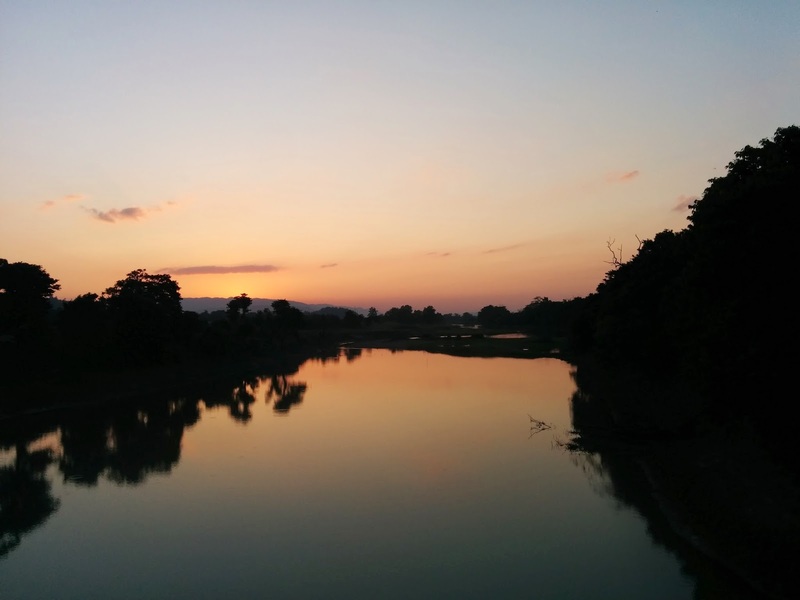 Our last stop in the safari was a view point by a river. All the jeeps congregated there and it soon got fairly noisy. We were allowed to alight from our jeeps here and use the restrooms if need be. Now, these restrooms were a thatched hut kind of affair. Simple, basic and serving the purpose. As we were walking about stretching our legs, we noticed a HUGE mother rhino with her calf right behind the restrooms, merely meters away from where we all stood! This is extremely dangerous and if the rhino had decided that we were a threat, she would have definitely charged. The result of which would have been fairly tragic. There was a bit of scare when the rhinos looked at us, and the forest guards had their guns ready (to fire in the air). But nothing much happened, luckily. I was surprised that the guards actually let these camera toting folks so close to the animals in the first place. But well, I guess everyone deserves a bit of excitement. When I got back to the parked jeep, I saw that our driver was perched on its top. He said "I have seen a rogue rhino bring an elephant down with its mahout, I am taking no chances with a rhino". 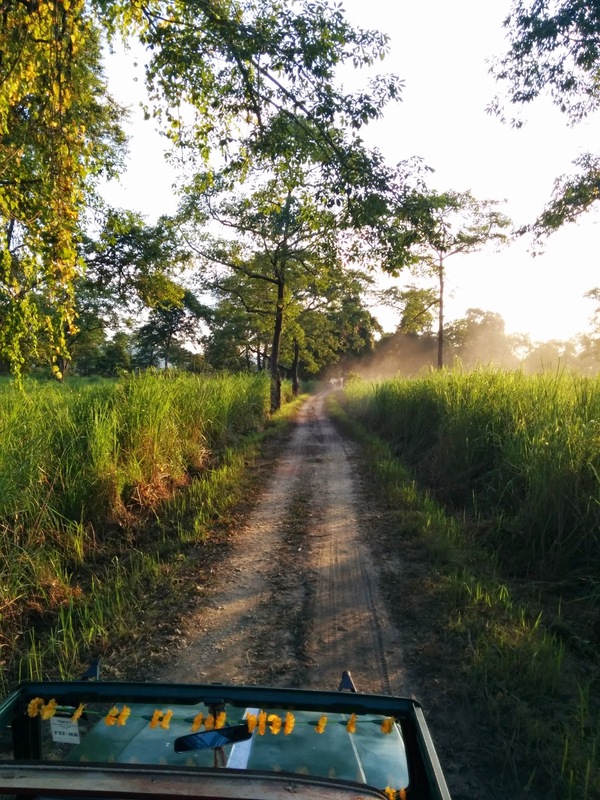 Driving back through the jungle as the sun set on the landscape around us was an experience in itself. Everything seemed so serene and calm. Beautiful. 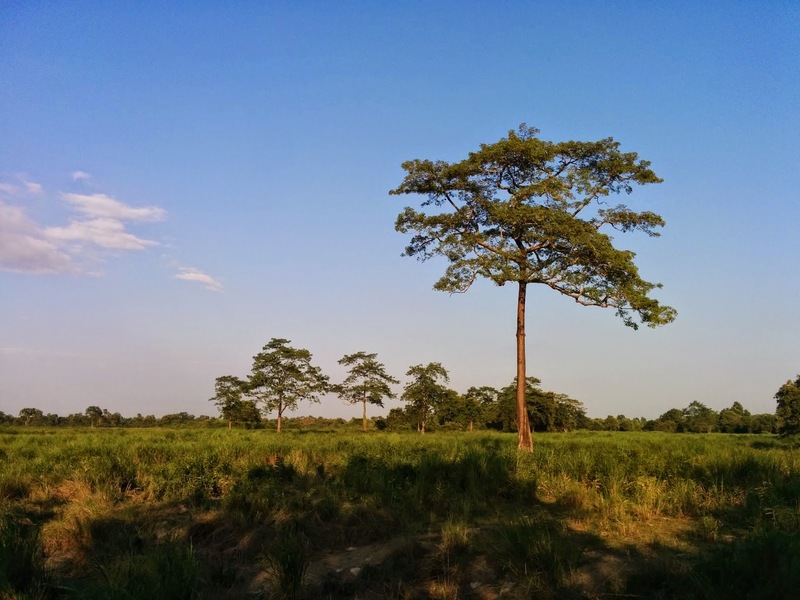 Kaziranga, is one of the places, where the Indian Rhino made its last stand. 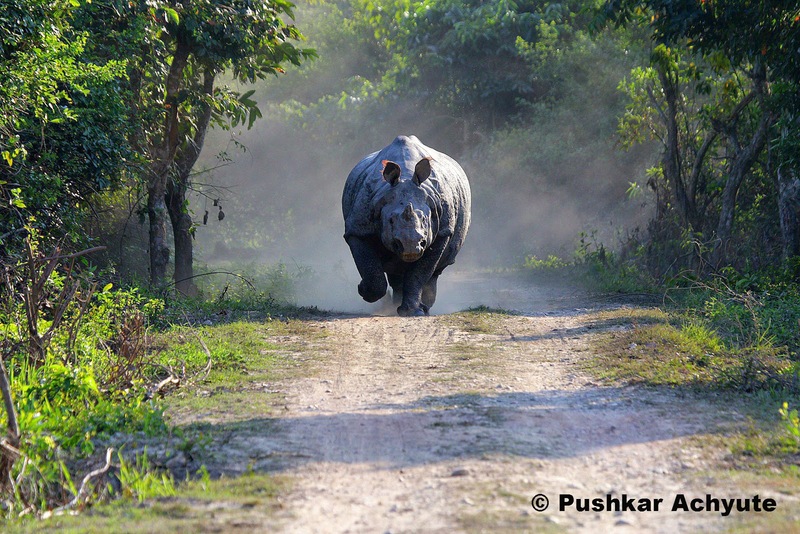 Today there are over 3000 Rhinos in Kaziranga alone. The situation was not so great 90 years ago. As this report on wikipedia tells us. However, you will notice that the population shows an upward trend, right around 1972. Wikipedia tells me that this is close to when Kaziranga was designated as a National Park (1968). In fact it was as early as 1905, when it was declared a reserve forest, thereby giving the Rhinos some respite from being hunted for sport. In 1910 all rhino hunting was banned in India. Just in time, as you can see from the numbers. While the numbers today are nowhere compared to where they could have been, Kaziranga, and other national parks have played a vital role in the conservation of this magnificent creature. Even to this day the Rhino is hunted down by poachers for its horn(which is believed to have great medicinal properties). One of the suggested approaches to deter poaching, is to dehorn rhinos. That is, to remove Rhino horns. This apparently has worked in Namibia, but I think that it is a stupid suggestion. But then, that's just my opinion. Maybe, there is more to it than meets the eye. A report with the decision is to come out sometime this year. Anyway, that was some random gyan about the Indian Rhino. Back at the resort, we caught up with Fou and Stephan for tea. How far can Fou and Stephan go? I had met Fou and Stephan during lunch, they were in biking gear and were looking for a place to stay. They had come on their motorbikes all the way from Germany! This had taken them 5 months. It was fascinating to hear their stories, and experiences across all the countries they had been too, I had to time and again pick my jaw from the ground and put it back in place, only for it to drop again, with the next story they recounted. They decided to just quit their jobs and motorbike across the world. They say, that time is not a constraint. Money is. Super! Their plan is to get as far as Australia and then depending on how the situation is get a job there before heading back home. We spoke at length and swapped notes. I gave them what little info I had on Kaziranga and they gave me info on Germany and things to do there. They have blog regularly so that you can follow their travel > Howfarcanwego, I strongly recommend you read it now! If this does not inspire you to pack your bags and travel, then nothing else will. A walk in the woods at night! Another bonus from the trip was, getting to meet Mr. Manoj Gogoi and his team, a small group of naturalists who work on rehabilitation of snakes and birds. Pushkar had made their acquaintance earlier that morning and he had been invited to the rented farm from where they operated. 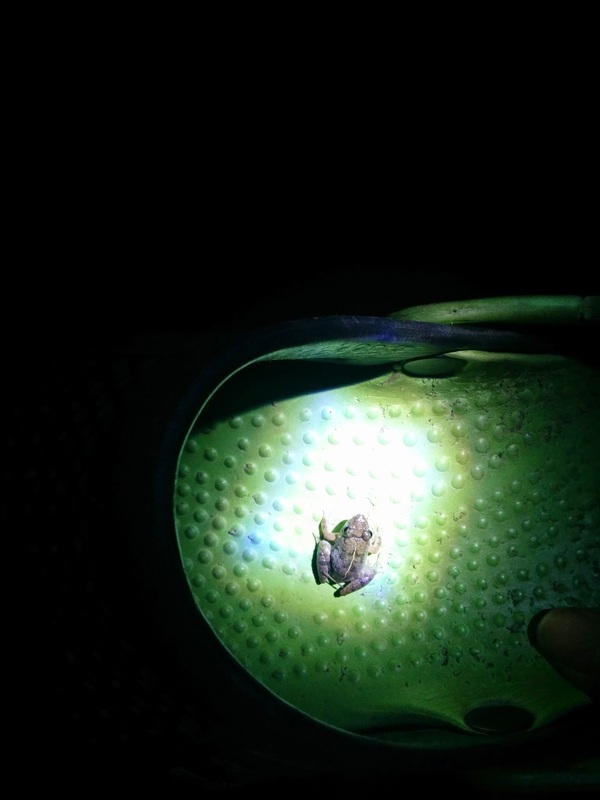 The idea was to try and foray into the forest at night. Pushkar asked me if I wanted to tag along and I was more than happy to! Manoj, is a simple guy, who has a deep passion for animal rescue and rehabilitation. So much so that he puts in almost his entire salary into this activity! We reached the place (about 3 kms from our resort) at around 9 and then headed to the edge of the forest. Just that evening a group of elephants had crossed into the farms that border the forest to dine on the paddy. We were hoping to encounter some elephants, in the dark. It was a scary thought, but the excitement of it all, made me tag along. Due to this man and animal conflict that arises from the fields being close to the jungle, the farmers have to stay up at night in their little machans , with tiny kerosene lit lanterns. If an elephant or a group of elephants do come along, their duty is to protect the fields, by chasing away the intruders. I would not sign up for such a job. But they have no choice but to resort to this to protect their livelihood. They use a sharp implement tied onto a bamboo stick, much like a spear. However, near the business end of this spear, they wrap a ball of cloth, dipped in a flammable liquid such as kerosene. If the elephants have to be driven out, they light this on fire and then prod the elephants away. The fire provides a little safety to the farmers, as the animals aren't too keen on facing a flaming spear. Our little trek to the edge of the forest across the fields, was lit by the moon. We avoided switching on the torches so as to ensure we do not startle any animal that we may suddenly come across. Nothing eventful happened. No elephant, boar or rhino made a foray into the fields when we were around. It was past 11:30pm when we got back to the resort and I had an early morning bus to catch, to make it to Shillong the next day. I had had a fabulous day and crashed for the night. More on my journey to Shillong in my next post. Stay tuned.